I love bread, I’m virtually obsessed with good bread and I need my daily dose of this wonderful, ancient invention. Every culture has their own bread tradition all over the world and it is so important to keep this up and to support traditional bakeries. Potato bread has a nice crust and is very juicy inside. The kitchen smells divine when the loaf is freshly out of the oven. I love to cut it into thick slices and then let some butter melt on it. With the first bite I know why I love to bake my own bread! 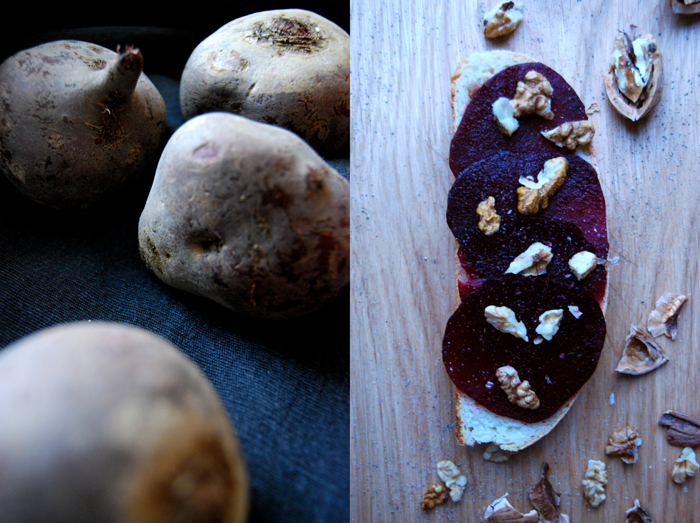 Today I want to prepare a little sandwich with cooked beetroot slices. I drizzle some balsamico and olive oil on top and sprinkle with walnuts. This makes a wonderful snack or starter for a dinner party. Cook 1 or 2 beetroots together with 2 bay leaves in salted water for 45 minutes (more or less depending on their size). Check with a skewer, it should come out easily, and rinse under cold water. Let them cool, peel and slice very thinly. For this bread I used spelt flour type 630 which I love to bake with but you can use any other flour. I chose dry yeast as it is a bit quicker to prepare but you can change to fresh if you prefer. Sometimes I prepare the dough in the evening and let it rise overnight. This is convenient for the weekend if you want some warm fresh bread on the table for breakfast. Grate the potatoes or press through a ricer (mashing works as well). Mix the potato water with the sour cream and olive oil. Combine 350g / 12 ounces of flour with the salt in a big bowl. You will add the rest of the flour while kneading the dough. Add the lukewarm water to the flour together with the yeast. Mix with the dough hook of your mixer until everything is combined, add the potatoes and continue mixing for around 10 minutes. After a few minutes you can start adding the rest of the flour. 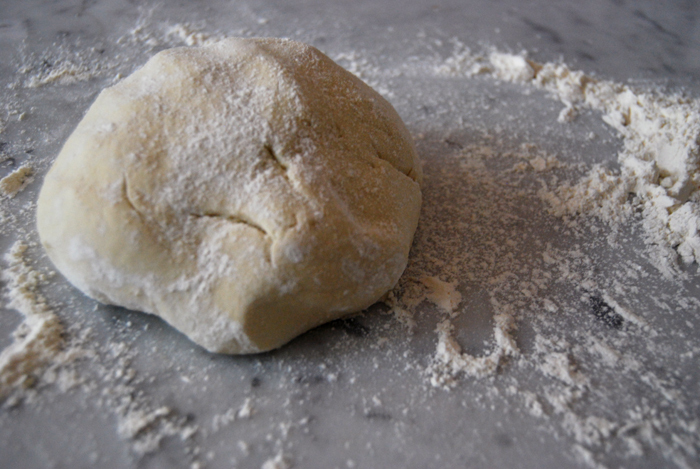 Put the dough ball on a floured working surface and continue kneading with your hands. You can put all your energy in this which is good for you and for the fluffiness of the bread. When I prepare the dough in the evening I place it in a clean, oiled and covered bowl in the fridge and let it rise overnight. You will have to take it out of the fridge 30 minutes before you can continue with the next steps. In case I want to bake my bread the same day, I put the dough in a clean and oiled bowl, cover it with a tea towel and let it rise in the 35°C / 95°F warm oven for 60-90 minutes. This works really well but make sure that your oven is set to top/ bottom heat and not to fan. When the dough is bigger and puffy punch it down and knead for a couple minutes. This one doesn’t rise as much as dough without potatoes but you should notice a change in size. 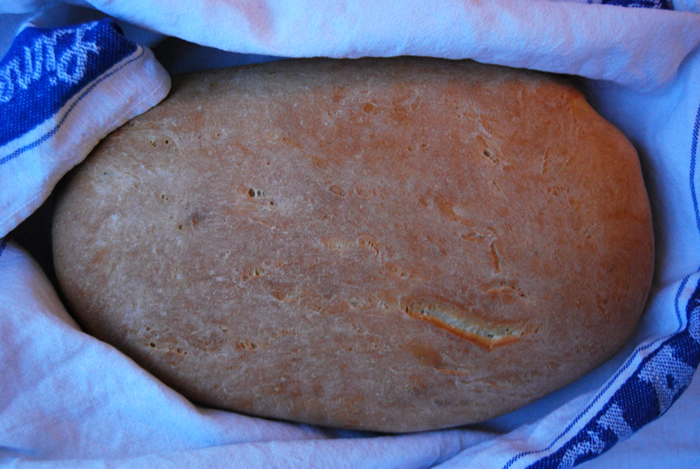 Now place your future bread on a lightly oiled baking sheet giving it the shape you want and cover with a tea towel. Give it another 30 minutes to rise in the warm oven again. Set your oven to 230°C / 445°F (for bread it works best to use top / bottom heat and not the fan setting). Bake your bread for 10 minutes, take the temperature down to 190°C / 375°F and bake for another 20 minutes. Test by knocking on the bottom side of the bread, it should sound hollow. Let it cool on a rack before you start cutting it. I minimise this to a few minutes as I can’t wait to try it. Not with this smell in my kitchen.